When planning an industrial power supply plant, the specific requirements of the individual production process are decisive for the design and mode of operation of the network and for the selection and design and ratings of the operational equipment. Since the actual technical risks are often hidden in the profound and complex planning task, planning decisions should be taken after responsible and careful consideration because of their deep effects on supply quality and energy efficiency. This book is intended for engineers and technicians of the energy industry, industrial companies and planning departments. 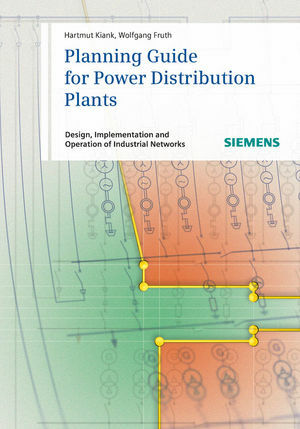 It provides basic technical network and plant knowledge on planning, installation and operation of reliable and economic industrial networks. In addition, it facilitates training for students and graduates in this field. In an easy and comprehensible way, this book informs about solution competency gained in many years of experience. Moreover, it also offers planning recommendations and knowledge on standards and specifications, the use of which ensures that technical risks are avoided and that production and industrial processes can be carried out efficiently, reliably and with the highest quality. born in 1952, is a principal expert for Power Distribution Solutions of the Siemens Energy Sector. In this professional management position, he deals with planning and project management of public and industrial power supply systems. He is a member of the VDE and author of numerous technical articles and reports (CIRED, ICEE). His "etz" essay "EMC and personal safety in multiply-fed industrial networks" was integrated the "VDE annual report 2007 of electrical engineering". born in 1966, is a project planning engineer and consultant support for Totally Integrated Power of the Siemens Industry Sector. He is co-developer of the network calculation and design software "SIMARIS design" and author of various technical publications. is a principal expert for Power Distribution Solutions of the Siemens Energy Sector. is a project planning engineer and consultant support for Totally Integrated Power of the Siemens Industry Sector. Planning recommendations: Medium voltage: Selection of the rated system voltage, determination of the short-circuit stress and the required short-circuit capability, definition of the optimum network configurations for industrial power supply, selection of neutral earthing, design and rating of the power system protection. Planning recommendations: Low voltage: Selection of the system voltage, short-circuit power and currents in the power system, design of the network according to the requirements, selection and design of the operational equipment, power factor correction, design and rating of the power system protection.